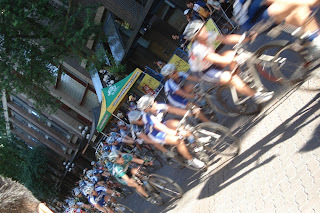 The Tour de Gastown is the most prestigious cycling race in Canada, with former Tour de France champion Lance Armstrong among its past winners. Named after "Gassy" Jack Deighton, riverboat captain and saloon operator, the heritage district of Gastown boasts a variety of trendy boutiques, clubs, offices, and eateries along its cobblestone roads. The 2008 edition began soon after Gastown's signature steam clock chimed at six o'clock. The restored version of the world's first steam powered clock sprayed me with droplets of water, briefly obscuring my vision. As onlookers watched from both sides of the street and I wiped my glasses dry, the women's cyclists took off. The laps were fast and furious on the 1.2 kilometer road course, leaving the 40,000 spectators little time to blink. I walked against the direction of the circuit to see the oncoming racers from various angles. The women's race was won by Gina Grain of Burnaby, and I left before the men's race started. Recovering from the bitter aftermath of our argument, it was time for my friends and I to locate a suitable club for me to formally debut in. After some tight parallel parking accompanied by colour commentary from one of the occupants of the vehicle, we wandered the Granville Entertainment District in search of a club with decent music, high quality prospects, and a low cover charge. We rejected the Plaza Club and Caprice, before securing entry to Crush. My driver's license was verified and I was frisked by a burly man before I was allowed to enter the premises. Dark, loud, and sparse, the interior was unwelcoming. Scantily clad women of diverse ethnic backgrounds gyrated in synchronized formations on the dance floor while sinister or ridiculous looking men leered from all sides. The females danced in pairs or triplets, collapsing into a single object when any predatory males neared them. The defensive schemes practiced by them far surpassed any employed by professional sports franchises. Disappointed, my friends and I went to Denny's. I craved some cheesecake. As the hour was late, the 24 hour diner was a perfect location to wind up the night. After going over the menu it was not the cheesecake that caught my eye, but the brownie. It was rather large and I could not finish it all. When I magnanimously offered to share, my friends believed I would charge them for the privilege, but revenge is not in my nature. Industry expert Anish infers: "Arnab doesn't need words to charm the women. His grunts are enough to fill even the most reserved of them with insatiable lust!" My long awaited introduction to Vancouver's clubbing scene took place on a steamy summer's night. It was a Friday, so I was already downtown for work. As it takes a minimal amount of effort (if any) for me to look like a heartthrob, I had come prepared in the morning so I would not have to return home after work to change into something presentable. Sporting a dark blazer with a tight gray shirt underneath, slim fit jeans, polished shoes, and a couple of days worth of stubble, I was a morale booster in the office and a traffic stopper on the streets. On Davie St. there were no automobiles present and a critical mass of cyclists passed through hoping to catch a glimpse of the Indo-Canadian Temptation. Since the clubbing scene does not start coalescing until near midnight, I had quite a few hours from the time I stopped working to the time I would begin clubbing. My friends who were supposed to accompany me had not made any dinner plans. Repeated suggestions were ignored and inquiries were left unanswered, so I had proceeded to have dinner with another friend at Kadoya, maker of specialty sushi, on Davie St. Just as I was finishing up my meal, I received a phone call from the girlfriend of one of the guys who would take me clubbing. She said she would pick me up and take me to Incendio, the restaurant where the rest of the guys had already started having dinner. After I was delivered to Incendio and offered a seat at the table, my companions enticed me to share some of their leftover pizza and wine. When the waitress appeared with the bill though, they insisted on splitting it evenly amongst everyone. I objected strenuously, as I had barely touched the food. Not only that, my friends had began eating without me, I had not been present when the food was ordered, and it was not common practice to charge money for samples. They began cursing loudly, offending the parents of young children seated at nearby tables. Several times the waitresses came by to check if they could help in any way (such as by providing a calculator). When I was offered a sample of the leftovers, I had believed it was a gracious gesture, but it was not to be. I stood my ground bravely and calmly, one man against many. Possessing much more than a modicum of decorum, I remained civil and offered to pay half of what they would pay for the meal. This offer was flatly rejected and we were at an impasse. The argument had lasted many minutes. This was my final offer. A neutral observer till now, my friend's girlfriend sprung into action and offered to pay the remaining half so that my combined portion of the total cost would match theirs. With no shame and little dignity, they accepted the offer. It had gotten quite late, so we rushed off to find a club. One of my companions suggested going to our desired club in the daytime before they began to start charging an entrance fee, getting a stamp on our hands as proof, and then returning again later at night. Anish, an expert in the field, responded: "I suggest you regale the ladies with your strategy to get in free. Women love frugal men."